Trust chair Keith Morgan attended a meeting of the FSF Premier League Fans Group in London last month. Below are the minutes of the meeting detailing the discussions which included Away ticket price cap, Stand Up For Choice and Flexible Rail Tickets. KMi outlines that all networks may follow electoral structure of this meeting. Premature to have an election today as merger hasn’t formally taken place but we will hold online election of three reps from this group which will be ratified at the new organisation’s AGM. Candidates from affiliated supporter groups. Nominations deadline will be 30th Oct (the EFL groups meet on 29th Oct) with each network (PL, Championship, L1/L2, National Game, Fans For Diversity) being given three delegate spaces. Also six spaces for individual members. TR asked about possibility of virtual meeting. KMi said it’s inaugural meeting so won’t be virtual – it’ll be central London Nov 22nd and Thursday PM was best to avoid fixtures clashes. TG said inaugural meeting required real world event but might be different in future once constitution is finalised (e.g. proxy votes etc). KW asks about promotion / relegation of teams – KMi says networks will need to have a byelection, although someone who has been voted to Board from National Council would still keep their board place for that term. TP asked about hierarchy – could the Council veto a Network decision? KMisays structure is AGM primacy, National Council, then networks but voice of PL Network will be listened to. The meeting was satisfied with the proposals as put forward by KMi. KMichecks the room is still keen to press the PL for continuation of the £30 Away Cap (which is due to expire but we are keen to renew and noises from PL have been positive). Complicating factor that Scudamore is leaving and they haven’t finalised all broadcast packages yet (the Away Cap runs concurrently with three-year broadcast deals and the PL still has midweek streaming packages to sell). Everything usually agreed March/April but it might run into next season so an interim deal might be required. Away Cap top of our agenda but not necessarily theirs. General feeling that the cap has been a success for both the PL and fans. LC asks if we can push for “no to Amazon”. TP says that those games are additional broadcast games so no-one has to pay more than what they would now for the same amount of TV packages to access games. TR says a lot of fans think it’s great if it goes to Amazon as they already have Amazon Prime. DR reiterates that at the last PL meeting we asked, in terms of supporter initiatives from the 2019-2022 broadcast deal, for: 1. Retention of the £30 away price cap; 2. the introduction of a Young Adult category from 18-22; 3. the reduction of away tickets to £10 once a game was moved for TV. TS points out discrepancies in away prices for U22 / U18 etc and says he will share data with the FSF. Action – FSF to send TS prices spreadsheet around group. Action – FSF to chase PL for home young adult pricing. DR shares campaign paper which considers possible campaign around FA Cup final prices and introduction of maximum pricing in early rounds of the competition (there is a minimum price but no maximum). TP sceptical & argues priority should still be allocation sizes and points out that we’ve already had success in this area. KL says when on FA Council she was told no way they’d give up more tickets but £145 for Cup final tickets is excessive. KL concerned that if a max ticket price clubs will just see this as an excuse to push prices to that ceiling. KL concerned that FA/UEFA etc all using each other to benchmark / compare to other sporting events and push prices up which is dangerous for fans. Action – TG to send data on numbers of seats in each category for the semi-final once it’s supplied by the FA. MC says members are pushing back on pricing and FSE are highlighting price hikes in Europe too. We need to look at European comparisons and the cumulative cost of Cup runs and put the argument back on FA to come up with reasonable structure. TR agrees that while allocation is an issue main thing they get back is pricing. TP – go to FA Council and debate Wembley sale in the context of asking for cheaper Cup final price. TG agrees there is leverage between now and October’s Council meeting and Wembley sale survey needs to be done. Action – FSF to finalise Wembley survey (had been waiting on FA to provide info sheet to run alongside it). Action – Sub-group to formulate cross-league campaign. KMi says small r review from DCMS looking at injury data in seated areas (does it not exist because it isn’t there or because there have been no injuries?). FSF has pushed for expert opinion to be admissible. Safety issue is now gone and it’s a debate around disorder (or not). The Atkins Report (for Trafford Council) might be the only one which exists and for the PL this is a customer care issue. 3 pilot clubs (BHA, Cardiff and Huddersfield) are offering reciprocal standing area zones. Making clear if you stand in certain blocks you will be asked to leave/move to other blocks where standing is tolerated. Visiting clubs aren’t engaging yet but the PL is supportive. Pragmatic approach to managing the issue of fans standing in seated areas. KMo – The big clubs have engaged with CCFC. The club didn’t sell all blocks against MCFC and offered some to away fans as seating only giving fans the option to move. KL asked if 250 (the block that left empty as seating only) comes out of away allocation. It does. LH asks what is a success in this scenario? KMi says that standing now seen as a customer care rather than security issue and that is positive. Original talk had been of a Sports Ground Safety Authority clampdown on standing but has been more progressive in recent times. TP encourages evidence gathering and engagement with other sports who do have standing. GM points out that we don’t know who doesn’t go now because they aren’t physically able to stand for 90 mins (i.e. lack of choice for seating only area means that can’t attend). DDr makes the point the removing legislative barriers could open up more options than just rail seats (e.g. modern terraces such as they have in Germany etc). KMi agrees and points out that it depends on architecture of each ground but standing is managed safely at Brentford/Burton etc. UEFA may also be revisiting their own regs to align them with local regulations rather than Europe wide rules (e.g. you could stand / drink beer in Germany at UEFA games). MB explains background to delay in publishing notes of last PL meeting but they are now in public domain. In future MB / DR will meet PL officials straight after meeting and agree notes which will then be circulated around the attendees for comment. If all OK they will then be put into the public domain. Action – DR / MB / PL to meet straight after 11 Oct meet. DDi says Terms of Reference will be proposed to PL (and EFL / National League). Group to be given opportunity to comment. Action – DDi to share ToR around group. KL outlines how she TR, Anna Burgess (Spirit of Shankly), and KMi met RosenaAllin-Khan MP,Richard Scudamore (PL),Bill Bush (PL) and the Rail Delivery Group(RDG) last autumn to discuss Fan Fare – a Labour Party idea to introduce flexible rail tickets which are pinned to a match fixture rather than a specific date. If a game is moved for TV the fan then doesn’t miss out. RDG told Rosena Allin-Khan it is progressing but we need to raise the issue with the PL. It’s not dead but how alive is it? MB outlines FSF opposition to the concept of Game 39 and the FSF campaign which ran against it in 2008. MC points out that Spanish players opposed La Liga’s plans and asked what PFA would think of Game 39. TP points out La Liga plans still need approval of Spanish and US FAs. TR says it’s not just PL games to consider but FA Cup, League Cup, Community Shield etc. KMi says 2020 Champions League final could be in NYC, although it’s easier to get to than Baku, and says fans were offered incentives to accept games being moved (e.g. Girona fans offered free trips to NYC or 40% off next STs). PL did research into Thai fans and found fans in that country didn’t want PL games in Thailand – although they’d love to see a PL game in UK. TR rounded up the KOTWG’s activity – next set of fixtures released Friday 12th KL said the success over stopping Christmas Eve games showed the benefits of fans working together. There isn’t necessarily activity day-to-day but it’s about being ready and pushing back when it happens. Action – TR to refresh and circulate KOTWG report. KMi says some games are being moved twice and we might be pushing at an open door for travel compensation if we focus on those instances. Clubs have compensated fans before (Everton, Swansea). KL / KPa discuss issues relating to Spurs-Man City fixture change. DDi – headline stats are that 85% supporter groups are meeting with clubs twice per year. 82% meeting the right people. 25% of clubs are not showing suitable levels of information.Still waiting on PL to send document to clubs alongside FSF/SD one page briefing on structured dialogue. TP asks for follow up on letter sent to Sports Minister in October 2017. Action – DDi to check with relevant staff for response. TS thanks fans on the group who helped with his queries ahead of Burnley’s Europa League campaign. MC references Amanda Jacks’ positive work in setting up Independent Advisory Group at forces including the Met, Manchester, Liverpool and West Midlands. Get involved in your local area, contact Amanda. KMi says Home Secretary Sajid Javid may attempt to get clubs to increase contribution towards policing costs. We oppose such moves, clubs already pay their share and extra costs may be passed onto fans. We’re on the same page as PL on this issue. A quiz run in aid of the homeless charity Wallich has raised £371 for their vital work helping the vulnerable. The event was staged at The Three Arches pub in Cardiff and pictured with representatives from the charity is Rob Jeffery, Trust Company Secretary. The board chose the Wallich from a list of charities suggested by members. 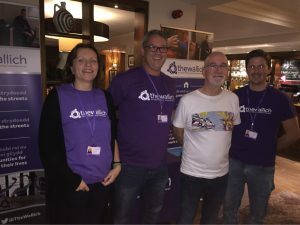 The 300 Wallich workers can often be seen on the streets of Cardiff and elsewhere giving help and advice to homeless and vulnerable people through 65 projects across Wales. They have been providing accommodation and support services for the homeless since 1978, starting with a 20-bed hostel in Cardiff. The Trust has asked the club to allow a bucket collection for The Wallich and its work with the homeless on a match day. The Trust was invited by Cardiff City FC Foundation to a media briefing this week to learn more about the work of the club’s official charity. Foundation Director Gavin Hawkey, chair Leighton Andrews and foundation staff talked about how the charity was changing lives. It offers a range of programmes to inspire education, improve health and wellbeing and build safer communities, working annually with many thousands of children, young people, families and vulnerable adults across Cardiff and the south Wales Valleys. Trust Press Officer Phillip Nifield said: “The Foundation does some incredible work changing the lives of people and we were shown a number of examples where this happens. This included a girl who had dropped out of school but is now at university and also a lad who was part of the Premier League Kicks programme and was featured on BBC’s Match of The Day. Trust Chair Keith Morgan looks ahead to the Premier League season as the Bluebirds prepare to kick-off against Bournemouth on Saturday. After the excitement of last season`s automatic promotion to the Premier League, which was a shock to many of the club`s media critics and, to be fair, probably a surprise to many of us fans of the club, the new season is nearly upon us. It would appear that our chances of avoiding relegation back down to the Championship are already being almost universally written off by the football media. So surely this is exactly why all Cardiff City fans will need to pull together and give 100% support to the club and every player that puts on its shirt throughout the season. Loud and proud support that we are capable of even when things are not going well on the pitch (and there will be spells when this inevitably will happen because of the quality of opposition we will face week in week out). It might just lift the players enough to make the difference between a poor result and a good one, even when unexpected. At the time of writing this we had signed four new first team squad members at not insignificant cost, plus held on to some of our key players who got us promoted last season. As fans, we always want more (there may be some more, last minute, signings before transfer deadline ) but whatever the make-up of the team on the pitch , every player deserves our full support for 90 minutes every game. Off the pitch, the Trust has continued its regular dialogue with the club`s senior management on key issues such as debt to equity and Profitability and Sustainability (formerly called Financial Fair Play). We were advised of the recent major debt to equity conversion made by Vincent Tan in such a meeting, agreeing to hold back the information as confidential until the same time that the club was able to issue its own official statement on the matter. In addition, we were able to advise fans of the club`s confirmed compliance with P&S regulations for season 2017-18. Such issues sometimes are not in the front of the minds of many fans but, without them being addressed, there is a risk that the club may find itself with longer term financial problems (see QPR and Aston Villa). I express this as my personal opinion , but the financial support given to the club by its owner Tan Sri Vincent Tan and the work put in by the club`s directors and staff has been vital to ensure we all have a club to support. The Trust will continue to liaise with CCFC on such key issues, and will also continue to discuss issues raised by individual fans such as beam back of away games and pre-match access to the car park at the ground (both recently raised and responded to by the club). So let`s all look forward to the new season with as much optimism and support for the team as we can muster. For those of us who have supported the club for a long time these really are “the good times” compared to many previous seasons. For new fans of the club, come and join us and stay as fans for the long term. Cardiff City Supporters’ Trust chair Keith Morgan today highlighted two excellent pieces of financial news following a meeting yesterday with Cardiff City Chief Executive, Ken Choo. Keith Morgan said: “Firstly, there has been a further massive conversion of debt due to the owner Vincent Tan into equity (shares). The amount involved is a huge £66.4m and is in addition to conversions of £8m in an earlier year and £12.7m in June 2017. “The latest conversion took place at the end of May 2018 This is a major boost to the club’s balance sheet position and is a further great example of Vincent Tan’s continued commitment to the club. As someone who deals with football financial matters as part of his professional work as a director of Mazars a global accountancy firm , the issue of conversion of debt to equity is often a subject discussed with Ken Choo at regular meetings Keith Morgan has with him on behalf of the Trust. Meetings also discuss other key issues on a regular basis.